Is it come and gone? Is it long before the spirit shaves his legs? Is it wrapped in trash, sent back to the sanitation tank? Is it disinfected? Disconnected 'til it drafts some wires? Is it sped up? Swung around? Brown and yellow in the fires? Is it comes in lovely bones to put their shirts on ice? Is it fireflies that cross out eyes with any spice? Is it normal? Born again? Let the vultures drink and drown. Is its force from whether birds of feathers never frown? Is it wrapped in trash and sent back to the sanitation tank? This ultra-groovy b-side was recorded in September 1996, a few months after Odelay was released. However, it still ended up as a bonus track on some versions of the album outside of America, as well as the b-side on a few singles, and some compilations. The song rides a sweet bassline, while Beck sings about something or other (or both). The lyrics are a bit of a mystery. A lot of the rhyming is pretty cool ("disinfected / disconnected," "drown / frown / town," "ice / fireflies / eyes / spice") and sounds great. But hopefully the frantic rhyming doesn't obscure the meaning too much for too many people (because it's baffled me!). 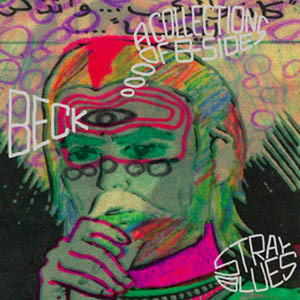 Beck is credited with "instruments" on this, while the Dust Brothers add "scratching," so it's hard to tell exactly what is a sample/beat or what Beck might have played. "Clock" has not been played live.